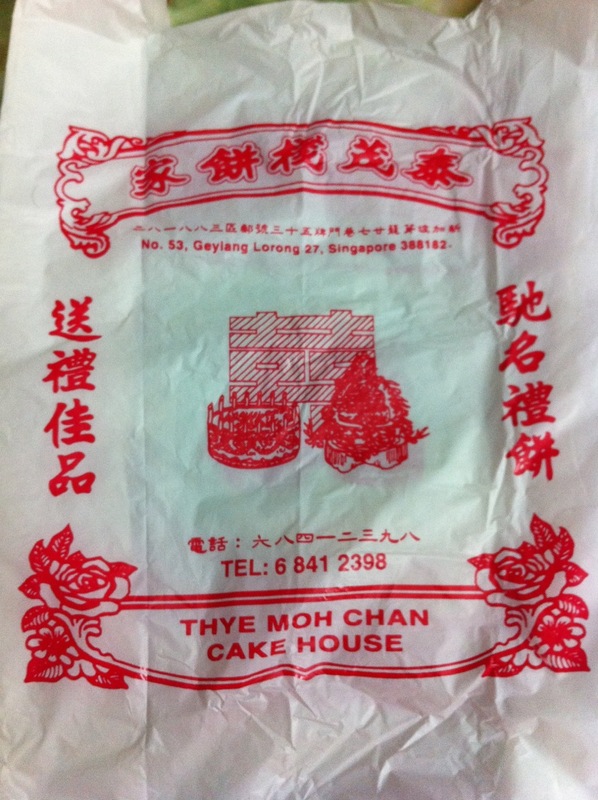 Thye Moh was the cake shop of choice for many Teochew families – we buy moon cakes, wedding cakes, cakes for ancestor worships, cakes for elders’ birthdays, sugar lions for religious worship – all except maybe your four-year-old birthday. Now this place will be another place in our history book. Our family lived just a Lorong (a street) away from Thye Moh. We know the boss for years. 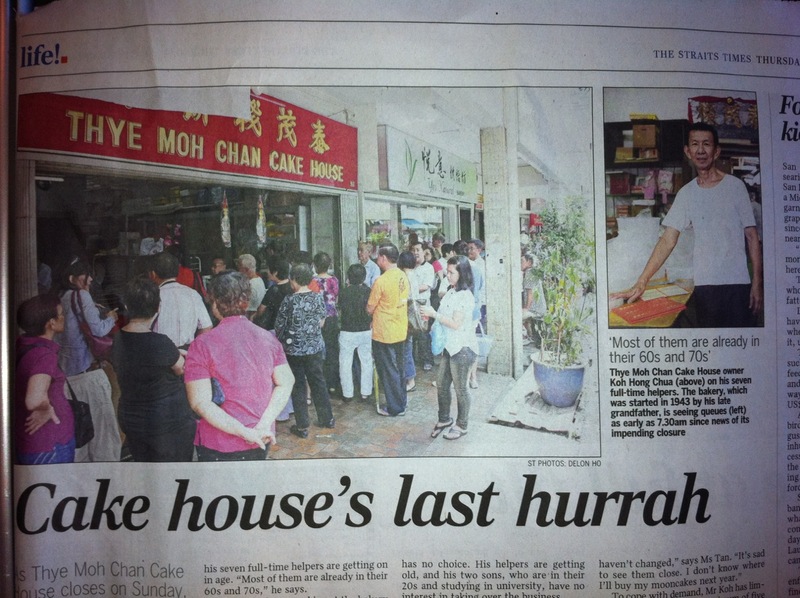 Even then, we cannot get one last order of their famous Teochew moon cakes last year. Called Lar Piah, it comes in sweet or salty varieties. Unlike the Cantonese versions, they are made of a crusty skin that flakes off with the slightest pressure. The filling is a sweet (or salty) tau-sar (bean paste) that is also referred to as “Lar Kow” – a caramelised version of the tau-sar. It is sticky – imagine melted cheese but sweet, and has the taste of tau-sar. Many other cake shops make the Teochew version of the moon cake, but this is only one that has stuck to making Teochew confectionery all these years. A purist I may say, other have strayed away from their Teochew roots and meddled in Cantonese style mooncakes and other more modern confectionery, not Thye Moh. You can almost get the traditional Teochew cakes here when you need them. The bags used to be made of paper with red strings. Many would remember them from the 大中國 mooncakes from Chinatown (they still give them out these days), but in recent years, they switched to the plastic bags as well. However the design on the bag is still same as the paper ones. Consolation prize, we got some free sesame cakes from the boss as a farewell gifts, and my sister managed to save only these few slices for me. 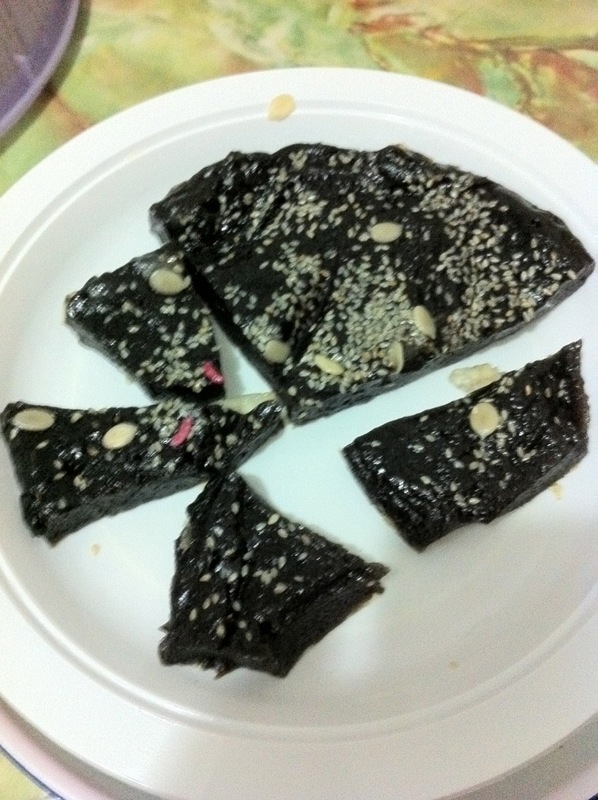 It is a sticky delight of sesame paste with sprinkles of sesame seeds and melon seeds. Goodbye Thye Moh, we will miss you.